If you have been hanging around this little corner of the blogosphere for a while now you will know that there are a few brands that I am ‘slightly’ obsessed with. 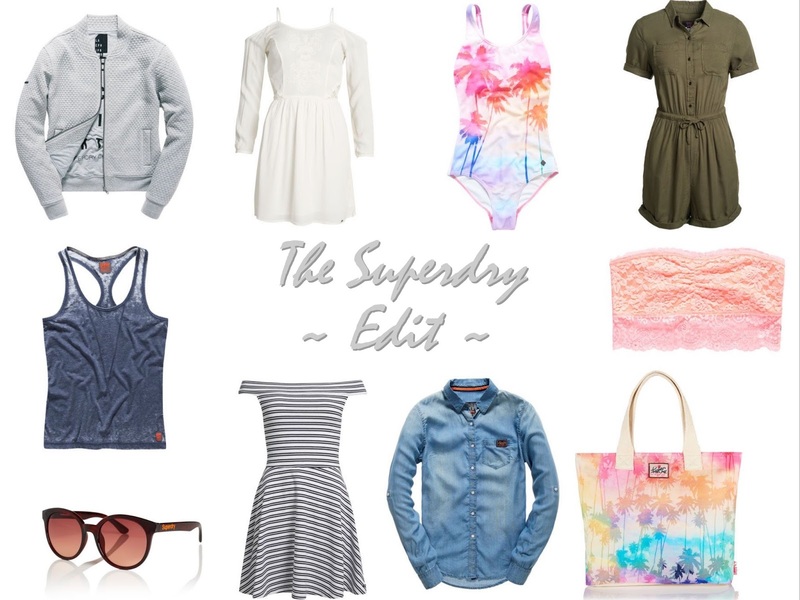 You will also be aware that one of said brands is Superdry and here are 10 simple reasons why. 1 | The Bomber | £54.99 | I’ve been looking for a bomber jacket for a while now, I love the look of them, that they can add a casual twist to any outfit and that they will see you through Summer & Autumn too. This quilted version from Superdry is right up my street and I know that I will take me through Autumn/ WInter 2016 and beyond. 2 | The Lacy One | £44.99 | A simply quintessentially British Summer dress with a modern twist thanks to the peekaboo shoulder detailing. I can happily imagine wearing this for meals out, on holiday and to Summer weddings too. 3 | The One Piece | £39.99 | I have never been a fan of one piece costumes, until this year that is. Suddenly I see the beauty of them, the versatility and style. This palm print one epitomises Summer and would look great on the beach or teamed with a pair of shorts for an afternoon of sight seeing. 4 | The Essential | £14.99 | I find these little bandeau tops so useful in Summer don’t you? They look fab layered under drop arm vests, dungarees and pinafore dresses and if you’re brave enough (unlike me) you could team one on it’s own with shorts! 6 | The Bardot | £34.99 | Be still my beating heart I think I have found the bardot of my dreams! Not only does this dress have a super flattering shape & print, it’s also available in three different colours. Well thats Monday, Tuesday & Wednesday sorted then. 7 | The Denim | £44.99 | We all know that British Summer Time really means ‘sunshine & showers’ instead of ‘heatwaves & droughts’ and that in reality we should always keep some kind of cover up at hand. Layering is my word of the moment and this Wilson shirt would look great thrown over your favourite tee or tank on those cooler evenings. 8 | The Tote | £29.99 | Perfectly made for those day’s at the beach, the afternoon picnics and evenings sat outside your favourite pub – the tote bag has so many uses. This cotton lovely is available in a variety of prints and would make the perfect poolside companion this Summer. 9 | The Cat-Eyes | £24.99 | I’ve long been a fan of Superdry’s stylish yet affordable sunglasses and have been known to don the wayfarer & aviator styles before now. However, these ‘cat-eye’ shape frames are stunning, different and so on trend thanks to their tortoiseshell frames and ombre lenses. 10| The Playsuit | £44.99 | Gone are the days where playsuits are just for children – these days they’re available in styles to wear to the office, to the beach or to your favourite festival including this khaki lovely. We all have those stores that we know and love and Superdry is that store for me, it never fails to impress and I never fail to find something I need to add to my collection! All pictures courtesy of Superdry.com.